The Student Textbook is divided into 120 lessons, all of which are included in the Checker. The textbook also contains 12 investigations, an appendix topic that presents additional instruction, supplemental practice problems for remediation, an illustrated glossary, and a comprehensive index. The Solutions Manual contains step-by-step solutions and answers to all textbook and test questions. You will need the Solutions Manual when using the checker (for example, for assigning partial points on test questions). The Tests and Worksheets booklet provides all the worksheets and tests needed by one student to complete the program. There are 23 tests, all included in the Checker. There are a large number of Facts Practice worksheets. We recommend use of Dr. Aardsma's Math Drill (see link in navigation bar at left) in place of these worksheets. The booklet also contains recording forms for students to show their work and for parents to track student progress. 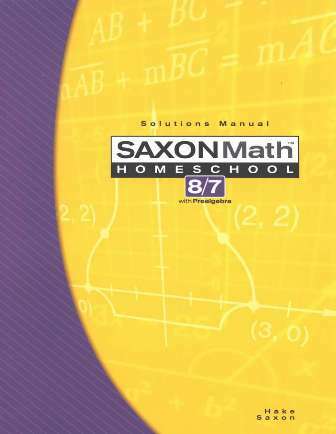 Most parents purchase the three books described above together as the Saxon Math Homeschool 8/7 Kit rather than purchasing the pieces individually.